For more information, please contact Laurel Sparks, Lecture & Fellowship Coordinator. The deadline is March 1 (by 12:00 midnight EST). Applicants must complete the online application form. Submissions made via postal mail, fax or any other means will not be accepted. Please review the following Guidelines and Required Information prior to completing the application form. Send transcripts: Transcripts must be official and include at least two full years of completed college-level work (4 semesters or 6 quarters), not counting AP credits. If you are a transfer student and have attended your current school for less than two years, please submit transcripts from your previous school(s) in order to provide a record of at least two full years of completed college-level work (4 semesters/6 quarters), not counting AP credits. Post-Baccalaureate and first year graduate students must submit both undergraduate and post-graduate transcripts. Official transcripts are copies which come from your University's Registrar in unopened envelopes; we must received these in their unopened state. We do accept official electronic transcripts if your university offers them in this version, they must be sent to us directly from your University's Registrar's Office..
Official transcripts must be mailed to: Laurel Sparks, Fellowships - Transcripts, Archaeological Institute of America, 44 Beacon Street, Boston, MA 02108. If your school can provide official transcripts electronically, they may be emailed to LSparks@archaeological.org. ALL transcripts must be received by the March 1 deadline. All other application materials must be completed online, and received by the March 1 deadline. All application materials including transcripts and letters of recommendation must be received by the March 1 deadline. Incomplete or late applications will NOT be considered by the review committee. Applicants will be notified of the committee's decision no later than April 20. Winners of the Scholarship must agree to submit a final report on their use of the funds and what the experience meant to them no later than 60 days after completion of the field project and to join the AIA at the student membership rate if they are not already members. Final reports will be posted on the AIA's scholarship web page and may be featured in other AIA publications. The AIA offers congratulations to the following 2018 Scholarship recipients, who were chosen out of the field of over 100 applicants. In 2018 we were able to award scholarships to 25 students due to the generous support of the Waldbaum Scholarship Fund and the Von Bothmer Publications Fund. To help support the Waldbaum fellowship program, please contact Bruce Keeler at 857-305-9357 or bkeeler@archaeological.org. Caroline Beatrice is a senior at Wellesley College studying Art History and Italian Studies. She will attend the Eastern Boeotia Archaeological Project. Read about Caroline's experience. Elena Bowen is a graduate student at UCLS studying Conservation of Archaeological and Ethnographic Materials. She will attend the Peru: Corral Redondo field school. Read about Elena's experience. Sean Cantrell is a junior at University of Michigan studying History and Classical Archaeology. He will attend the Gotland Archeological Field School. Read about Sean's experience. Ty Catello is a junior at Rutgers University studying History/Ancient & Medieval Civilizations. He will attend the Rutgers University Archaeological Field School in Italy. Read about Ty's experience. Brent Christianson is a senior at Washington State University studying Anthropology. He will attend the Kissonerga-Skalia Excavations. Read about Brent's experience. Lauren Clark is a junior at University of Montana studying Biology and Anthropology. She will attend the Crow Canyon Archaeological Center Field School. Read about Lauren's experience. Shannon Conley is a senior at George Mason University studying Anthropology. She will attend the Astypalaia Bioarchaeology Field School. Susan Crane is a graduate student at University of Texas Austin studying Classical Archaeology. She will attend the American Excavation at Morgantina: Contrada Agnese Project. Read about Susan's experience. Cannon Fairbairn is a senior at Brigham Young University studying Ancient Near Eastern Studies – Hebrew Bible/Anthropology. She will attend the ad-Deir Monument & Plateau Project. Read about Cannon's experience. Adriana Feely is a senior at the University of Texas at San Antonio studying Anthropology. She will attend the Belize Summer Field School in Archaeology. Jason Gren is a junior at the University of Winnipeg studying Classics and History. He will dig at the Roman city of Aeclanum through The Apolline Project and attend the Underwater Survey of Portus Iulius project. Read about Jason's experience. Alexander Huaylinos is the 2018 New York City Waldbaum Scholarship recipient. He is a junior at the City College of New York studying Anthropology. He will attend the NSF REU Site: Exploring Evidence of the Anthropocene project. Mary Maisel attended American University studying Anthropology. She will attend The Gateways Project. Read about Mary's experience. Rose Moir is a junior at McMaster University studying Anthropology. She will attend the Stélida Naxos Archaeological Project. Read about Rose's experience. Rachel Murray is a post-bac at University of Arkansas studying Classical Studies, German/History, Medieval and Renaissance Studies. She will attend the Marzuolo Archaeological Project. Read about Rachel's experience. Johanna Najera is a junior at University of California Santa Barbara studying Anthropology and Art History. She will attend the Settecamini Archaeological Project. Read about Johanna's experience. Abbey Perez is a junior at Rice University studying Anthropology and Visual and Dramatic Arts. She will attend the Rice Archaeological Field School's Horrea Agrippiana Project. Read about Abbey's experience. Courtney Roark is a junior at University of Virginia studying Archaeology and Environmental Sciences. She will attend the Colonial and Native Worlds Field School on Ossabaw Island. Read about Courtney's experience. Samar Sydeda is a junior at Stony Brook University studying Anthorpology and Human Evolutionary Biology. She will attend the Origins Summer Field School at Turkana Basin Institute. Madeleine Trinco is a junior at College of DuPage studying Anthropology. She will attend the Czech American Field School. Read about Madeleine's experience. Tara Wells is a senior at Oberlin College studying Latin Language and Literature & Greek Language and Literature. She will attend the American Excavations at Morgantina: Contrada Agnese Project. Read about Tara's experience. Andrew Welser is a junior at The King’s College studying Politics, Philosophy, and Economics. He will attend the Upper Sabina Tiberina Project. Read about Andrew's experience. Crae Wilkins is a junior at Binghamton University, State University of New York studying Anthropology. He will attend the Hågerup Cemetery Excavation. Read about Crae's experience. Helen Wong is a junior at Brandeis University studying Classical Studies, History. She will attend the Kastrouli Project. Read about Helen's experience. Blair Betik is a junior at Southern Methodist University studying Art History, Anthropology, and Italian. She will participate in the IFR Global: Mohegan Archaeology Project in Connecticut under the direction of Dr. Craig N. Cipolla. Read about Blair's experience. Shyiesha Carson is a senior at the University of West Florida studying Archaeology. She will participate in the Luna Settlement Expedition in Pensacola, Florida under the direction of Elizabeth Benchley. Jonas Chang is a senior at Truman State University studying Anthropology and History. He will attend the University of Wyoming Archaeology Field School under the direction of Drs. Todd Surovell and Robert L. Kelly. Read about Jonas's experience. Amanda Chen is a first-year graduate student at the University of Maryland, College Park studying Estruscan and Roman Art and Archaeology. She will participate in the Dig Umbria Coriglia/Orvieto Project in Orvieto, Italy under the direction of Dr. David George. Read about Amanda's experience. Donavon Cooper is a senior at Mississippi State University studying Linguistics and Anthropology. He will attend the Villa del Vergigno Field School in Tuscany, Italy under the direction of McKenzie Lewis. Read about Donavon's experience. Brandi Delp is a junior at Western Carolina University studying Anthropology with a concentration in Forensic Science, as well as History. She will participate in the Medieval Cemetery Funerary Excavation in Transylvania, Romania under the direction of Dr. Katie Zejdlik-Passalacqua. Read about Brandi's experience. Philippe Depairon is a senior at the University of Montreal studying Art History. He will participate in the Argilos Excavation in Argilos, Greece under the direction of Jacques Y. Perreault. Roger Foster is a junior at the University of Texas at Tyler studying Social Sciences. He will participate in the Blue Creek Archaeological Project in Belize under the direction of Thomas Guderjan. Nathan Katkin is a junior at Columbia University studying Classics. He will participate in the Hadrian’s Villa project in Italy under the direction of Francesco de Angelis and Marco Maiuro. Flora Kirk is a junior at the University of Maryland, Baltimore County studying Ancient Studies with a concentration in Roman History & Archaeology. She will participate in the Roman Provincial Villa Excavation in Transylvania, Romania under the direction of Andre Gonciar. Read about Flora's experience. Yusi (Katie) Liu is a junior at the University of Wisconsin-Madison studying Classical Humanities and Art History. She will attend the Archaeological Field School at Nemea and Mycenae, Greece under the direction of Kim Shelton. Kevin McKain is a junior at Temple University studying Anthropology. He will participate in the American Excavations at Morgantina: Contrada Agnese Project in Siciliy, Italy under the direction of Alex Walthall. Read about Kevin's experience. Rodrigo Moscoso is a junior at the University of California, Berkeley studying History and Classics. He will participate in the Marzuolo Archaeological Project in Tuscany, Italy under the direction of Drs. Astrid Van Oyen, Rhodora Vennarucci, and Gijs Tol. Novella Nicchitta is a third-year undergraduate at the University of Victoria studying Greek and Roman Studies. She will participate in the Eastern Boeotia Archaeological Project in central Greece under the direction of Alexandra Charami, Brendan Burke, and Bryan Burns. Read about Novella's experience. Nicole Oster is a junior at the University of Georgia studying Anthropology and Classical Culture. She will attend the Colonial and Native Worlds Field School in Florida and Georgia under the direction of Victor Thompson. Read about Nicole's experience. Eleni Pitses is a fourth-year undergraduate student in a five year program at the Massachusetts Institute of Technology studying Mechanical Engineering with a concentration in Archaeology. She will participate in the Polis Region Prehistory Project in Cyprus under the direction of Kathryn Grossman, Tate Paulette, Andrew McCarthy, and Lisa Graham. Alexis Ruark is a junior at Drew University studying Classics. She will participate in the Vicus Martis Tudertium Project in Umbria, Italy under the direction of John Muccigrosso. Claire Seidler is a junior at New York University studying Classics – Fine Arts. 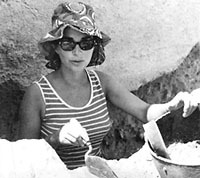 She will participate in the Yeronisos Island Expedition in Cyprus under the direction of Joan Connelly. Read about Claire's experience. Aimee Weber is a senior at the University of Arizona studying Anthropology and Geographic Information Science. She will participate in the Boncuklu Project in Turkey under the direction of Drs. Douglas Baird and Andrew Fairbairn. Read about Aimee's experience. 2011: Ianna Angelo (University of California, Santa Cruz: Betty Hope Archaeological Field School, Antigua), Emily Cook (Columbia University; Vesuvian Area Project, Italy), Geraldine Dobos (University of Nebraska-Lincoln; Antiocheia ad Cragum Archaeological Research Project, Turkey), Danika Jensen (University of Southern California; Ostia Marina Summer Archaeology Field School, Italy), Andrew Nicholl (University of Texas at San Antonio; Maya Archaeology field school, Belize), Leslie Perkins (Humboldt State University, Belize Archaeology Field School, Belize), Emma Thomas (University of North Carolina at Greensboro; Contisuyo Field School, Peru).